Literally, "count"; the quorum necessary for public worship. The smallest congregation which is permitted to hold public worship is one made up of ten men, boys over thirteen years being for this, as for other religious purposes, counted as men. See Bar Miẓwah. The minimum of ten is evidently a survival in the Synagogue from the much older institution in which ten heads of families made up the smallest political subdivision. In Ex. xviii. Moses, on the advice of Jethro, appoints chiefs of tens, as well as chiefs of fifties, of hundreds, and of thousands. In like manner there were the decurio among the Romans and the tithingman among the early English. The rule is laid down in the Mishnah thus (Megillah iv. 3): "They do not  'divide' over the Shema' [Hear, O Israel],  nor pass before the Ark,  nor lift their hands,  nor read from the Law,  nor conclude with the Prophets,  nor arrange the standing and sitting,  nor say the benedictions of the mourners or the consolation of the mourners,  nor the benedictions of the bridegrooms,  nor use God's name in preparing for grace after meals, with less than ten." The references in this rule are to:  The invocation "Bless ye" ("Bareku") with its response, which, with or without a "Ḳaddish" preceding it, is recited before the first benediction of Shema' in the evening and morning service. The repetition of the prayer proper, i.e., the Eighteen or Seven Benedictions, by the leader, and including the responsive Ḳedushshah. The priestly blessing (Num. vi. 24-26). The reading from the Scroll and benedictions before and after the lesson. The hafṭarah with like benedictions. Some ancient funeral ceremonies. Likewise forms no longer in use. About these it is said (Ket. 8a, b) that the mourners are not counted among the ten. The seven benedictions spoken at a wedding, or at any meal of the bridegroom and bride within a week from the wedding. The sentence "Let us bless our God, from whose wealth we have eaten," instead of "Let us bless Him from whose," etc., with which latter words grace is begun when three or more have eaten at the same table (Ber. viii. 3). The distinctions there suggested between ten and eleven, or between ten and a hundred, have not been followed in practise. 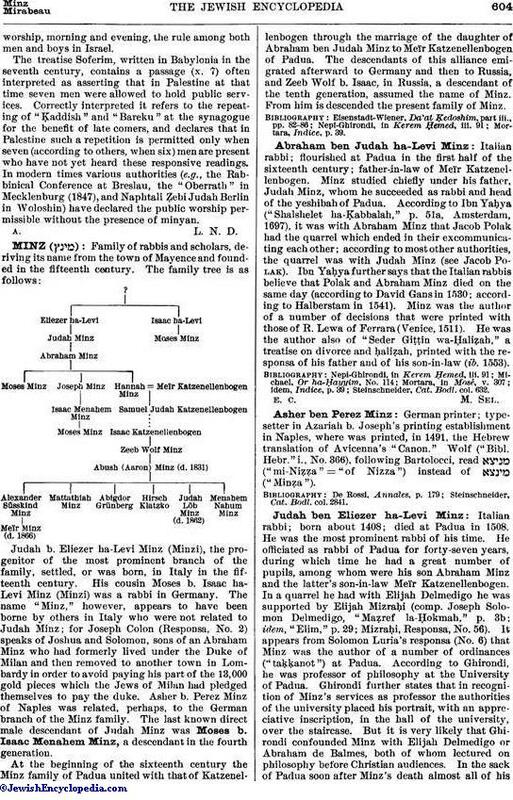 The Babylonian Talmud, in commenting on this section of the Mishnah, finds the Scriptural authority for ten men constituting a congregation in the words (Num. xiv. 27): "How long shall I bear with this evil congregation which murmur against me?" which it refers to the scouts who were sent to spy out the land of Canaan, twelve in all, two of whom, Caleb and Joshua, were faithful, and only ten "evil." All male Israelites of the proper age, unless they are under the ban, or have openly severed their connection with their brethren by professing a hostile creed, are counted among the needful ten even though they are notorious and habitual sinners (Oraḥ Ḥayyim, 55, 12). It is suggested (Ber. 47 and Yer. Ber. vii. 3) that while slaves or boys under thirteen are not counted in minyan, one slave or one minor boy may be admitted along with nine qualified men—at least when the boy is nearly of full age (a budding boy); and an example in an analogous case is given (Ber. 48a) of two prominent rabbis counting a boy as one of the three men necessary for saying grace after meals, it having been ascertained that he had ideas about God and prayer. The codes are somewhat divided on this subject: public service should be carried on with nine men and one infant only in "case of need," that is, if the attendance of a tenth man is not expected for that service (Oraḥ Ḥayyim, 55). Usage varies: in some synagogues nine adults and a boy over twelve years of age are deemed adequate for minyan; yet in the usage of other synagogues they are not adequate. While women may, in certain contingencies, take an active part in public service, by reading parts of the weekly lesson (Megillah 23a; allowed by all the codes, but rarely, if ever, carried out in practise), none of the authorities speaks of counting women in the minyan. The ten men include the leader. They and he should meet in one room or enclosure; Maimonides (Hil. Tefillah, viii.) discusses how the ten may be distributed in two adjoining rooms without destroying the quorum; but they must be within hearing of each other. In the same chapter Maimonides explains as the advantage of reciting the prayer with minyan: that it is sure to be heard; and, following the Talmudic passages below, the other codes concur. It was the firm belief of the sages that wherever ten Israelites are assembled, either for worship or for the study of the Law, the Shekinah (Divine Presence) "dwells" among them. Thus (Abot iii. 6): "R. Ḥalafta, the man of Kefar-Ḥananiah, says: When ten men sit down together to study the Law [another reading has it: "to act as judges"], the Presence dwells among them; for it is said (Ps. lxxxii. 1): God ("Elohim"] standeth in the congregation of God ["El."]." A baraita (Ber. 6a) puts it plainly: "Whence do we know that the Holy and Blessed One is found at the synagogue; or that when ten men say prayers together the Presence dwells among them?" It answers each of these questions with the verse of the psalm quoted above; it being understood that the word "'edah" (congregation) means ten or more Israelites meeting for a religious purpose. And the words in Solomon's prayer (I Kings viii. 28), "to hearken to the song and to the prayer," are shown by Abba Benjamin (Ber. ib.) to mean that man's prayer is best heard at the synagogue, for where men sing, there also they should pray. Both in the Mishnah and in the baraita quoted, consolation is held out to those who for study or prayer meet in smaller numbers—even to one who meditates or prays alone; but the stress is put upon the merits and sacredness of the minyan. The codifiers, such as Maimonides, his annotators, and the author of the Shulḥan 'Aruk, and many popular writers, have unitedly given strength to this sentiment, and have thus, for more than a thousand years, made the daily attendance at publicworship, morning and evening, the rule among both men and boys in Israel. The treatise Soferim, written in Babylonia in the seventh century, contains a passage (x. 7) often interpreted as asserting that in Palestine at that time seven men were allowed to hold public services. 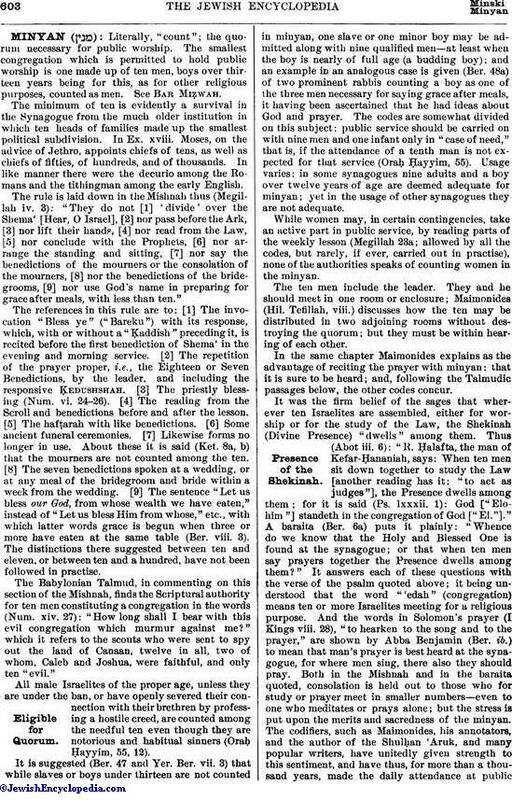 Correctly interpreted it refers to the repeating of "Ḳaddish" and "Bareku" at the synagogue for the benefit of late comers, and declares that in Palestine such a repetition is permitted only when seven (according to others, when six) men are present who have not yet heard these responsive readings. In modern times various authorities (e.g., the Rabbinical Conference at Breslau, the "Oberrath" in Mecklenburg (1847), and Naphtali Ẓebi Judah Berlin in Woloshin) have declared the public worship permissible without the presence of minyan.